InterContinental Jakarta MidPlaza has brought tropical sophistication to the inner city following the highly-anticipated launch of its JimBARan Outdoor Lounge. This laid-back venue is the ultimate place to end the day on a high note over social drinks and something to eat in the company of likeminded patrons. Actually it's quite hard to take a great sight-seeing spot of this lounge, because it's too dark *I should come earlier next time*. With its soothing waterways, exotic flora and contemporary seating pods, the lounge is a relaxing open-air environment in the urban heart of Jakarta. Jazz-dance lounge music and chill out tunes play continuously to set the mood. This concept caters to local trendsetters, business clientele and the after-five crowd looking for a stylish spot in the Central Business District to unwind and escape the traffic. "We have set out to redefine Jakarta's social scene with a laid-back venue that embraces the elements of nature. Our aim was to create an uplifting area for guest to recharge after being confined to an office or meeting room for most of the day. The lounge was designed to consciously move away from the effects of indoor air-conditioning and harsh lighting. This unique concept is unlike any other facility at a 5 star hotel in this city," comments Mr. Hendrik Eising, General Manager of InterContinental Jakarta MidPlaza. JimBARan Outdoor Lounge is open daily from 5pm until late every day of the week. It is the perfect spot to meet with friends and work colleagues whilst waiting for the traffic to ease. The lounge also lends itself to private events and special celebrations including weddings and parties. The lounge is adjacent to the hotel's main ballroom that also extends into a lush garden setting. Extra standing space is available with a spiral staircase that accesses the main pool and a terrace on the 2nd floor. Designed by renowned landscape architect St. Legere, JimBARan Outdoor Lounge is venue with a difference that celebrates the beauty of nature in the middle of the city. Intimate seating arrangements are conducive to small groups looking to have some have fun. The lounge is simply the hippest place to be at the moment. JimBARan Outdoor Lounge serves an extensive tapas menu along with tasty light bites. Signature dishes include Seafood Ceviche, Roasted Chili & Garlic Shrimp and Duck & Asian 5 Spice Sausages. Other gourmet delicacies will also be introduced in due course using seasonal ingredients to excite more refined palates. Drinks are prepared by a team of resident mixologists at a smart bar facility. There is a full selection of creative cocktails to choose from as well as boutique wines available by the glass and home-made teas infused with fresh fruit. The house specialty is a lively concoction known as Sunset in the City. It is made from Belvedere vodka, white rum, dark rum, banana liqueur, Malibu, pineapple, orange, coconut cream, coconut syrup and squeeze of lime. HERE'S THEIR SMART COCKTAILS !! Well, this is a must visit lounge in town ! Imagine that you could find different atmosphere of bar because this is Outdoor Lounge ! If you wanna take a great clear picture you should come here earlier or won't see the natural touch here. 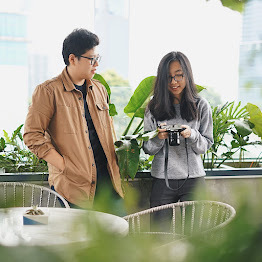 Price range for food IDR 30.000 - IDR 180.000++ and for drink IDR 40.000 - IDR 150.000++ (exclude premium alcoholic drink), approximately will spend IDR 200.000/ person, I think it's still affordable for such a really comfy lounge.